Ahead of U.S. President Donald Trump’s upcoming visit, Chinese President Xi Jinping held talks with the U.S. business tycoons in Beijing. The meeting was broadcast by Chinese state television and also made headlines in Chinese newspapers. According to CCTV’s report, Xi, together with other Chinese high officials, met the advisers to the business school of Tsinghua University, one of China’s most prominent universities on October 30. 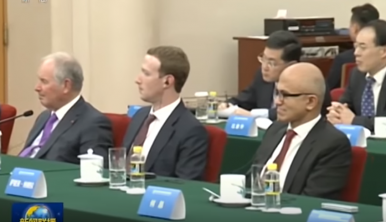 As the school’s foreign advisers, former U.S. Secretary of the Treasury Henry Paulson, Apple Inc CEO Tim Cook, Facebook Inc chairman Mark Zuckerberg, The Blackstone Group chairman and CEO Stephen Schwarzman, and Breyer Capital Founder and CEO Jim Breyer attended the meeting. What’s interesting is that CCTV’s video footage showed multiple China’s business tycoons, such as the founder of Alibaba Group Jack Ma and Tencent president and CEO Pony Ma, were also present, but CCTV didn’t mention these Chinese businessmen’s names at all in its report. It’s worth noting that the meeting took place at a magnificent conference room in the Great Hall of the People, where the Chinese Communist Party’s (CCP) 19th National Congress has just been held. It demonstrates the high-level of the meeting and the CCP’s intention of displaying the meeting as a propaganda show to the whole nation as well as to the world. Unsurprisingly, Xi discussed the important meaning of the 19th Party Congress to the attendees. He also mentioned that China will keep its national policy of opening up and pursue a mutually beneficial and win-win strategy. China is willing to work with the United States to take care of each other’s interests and concerns, properly resolve differences and contradictions, promote Sino-US cooperation, and achieve a win-win situation; we are optimistic about the prospects for Sino-US relations. According CCTV, the U.S. tycoons replied that Xi’s opening speech at the 19th Party Congress was impressive; they were amazed by China’s great achievement; and they were fully confident about China’s future. But CCTV didn’t specify exactly who said these compliments. An Apple spokeswoman told Reuters that the firm couldn’t “comment on Tim’s schedule and or meetings,” while Facebook also declined to comment on Zuckerberg’s details of his Beijing visit. In a post on his Facebook page on October 28, Zuckerberg said he was in Beijing for the annual advisory board meeting and posted a photo with Chinese students. “Every year this trip is a great way to keep up with the pace of innovation and entrepreneurship in China,” he added. But he didn’t mention his follow-up meeting with Xi either. Is Apple Kowtowing to China? Mark Zuckerberg's Wooing of ChinaFacebook’s China PushWill Asia Kill Apple?Apple to Transfer Chinese iCloud Operation to a Chinese State-Owned CompanyWhy Are Chinese Netizens Excited About Russia's Ban On VPNs?